Well over a month ago we told about The Mary Tyler Moore Show marathon on The Hallmark Channel that will be airing on Sunday, April 1 (no foolin'), but now we have more news! They were not going to air it on their regular schedule after the marathon, but yesterday they made some tweaks to their April 2012 schedule and The Mary Tyler Moore Show does indeed "make it after all" on the regular schedule after this marathon event. First, here are some details on the marathon: the marathon airs Sunday, April 1 from 10am-8pm with the ABC 2000 TV movie Mary & Rhoda airing from 8-10pm. View the episode info here! So after the marathon airs, the Hallmark Channel will air the show every morning. You'll have to be a night owl or an early bird to catch it (or DVR/TiVo it). Effective Monday, April 2 (technically Tuesday morning), Hallmark will air the show every morning in a block from 4-6am, seven days a week. It will replace an hour each of Frasier and I Love Lucy on weekdays and an hour each of Cheers and Lucy on weekends. That means Cheers will be off the schedule totally now. 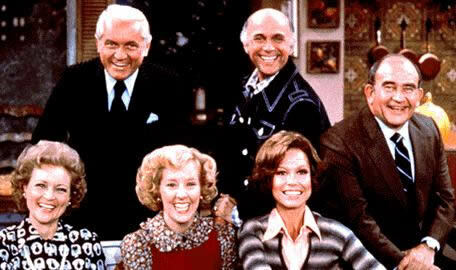 The Mary Tyler Moore Show will air right after The Bob Newhart Show block from 2-4am every morning. In case you're wondering this is how the weekday line-up looks like now: 6-8am I Love Lucy, 8am-10am The Golden Girls, 10am-3pm Martha at Home Block, 3-6pm The Waltons, 6pm-10pm Little House on the Prairie, 10pm-12am Frasier, 12am-2am The Golden Girls, 2am-4am The Bob Newhart Show and 4-6am The Mary Tyler Moore Show. Weekends is the same except 10am-10pm are a mix of movies and marathons. And speaking of marathons, in addition to Mary Tyler Moore on April 1, we have the following marathons: Little House on the Prairie on Saturday, April 7 from 10am-1am and I Love Lucy on Saturday, April 28 from 6am-10pm (don't forget there is a Lucy-Desi Comedy Hour marathon this Saturday - March 24). That's all we have for now, but who can turn the world with her smile? Only Mary Tyler Moore can, so tune in starting April 1! After only three airings in its new timeslot, Fox has pulled new comedy I Hate My Teenage Daughter off of the schedule. The multi-camera sitcom was airing Tuesdays at 8:30pm following Raising Hope, which is single camera. Fox aired four episodes in late fall, before returning it in March. But now it will have six episodes remaining on the shelf and Fox insists it will air in the summer, but we'll see. For now, Fox will air repeats of Raising Hope for the next two weeks (March 27 and April 3), before Glee returns to the hour on April 10. Raising Hope will air its final two episodes of the season at 9:30pm on April 10 and 17 right after New Girl, giving sophomore comedy Breaking In a two-week break. That comedy, which is also struggling, will return April 24 for three more weeks following new episodes of New Girl. Breaking In has a 13-episode order, but only eight would have aired. Maybe more to come in the summer, if at all? Alyssa Milano guest stars in episode nine, so we better see that. Fox has scheduled a two-hour Glee on May 15 and May 22 has part one of the American Idol finale at 8pm and the Glee season finale at a special time of 9pm. So hopefully Breaking In returns May 29, but that is still a while away and many things can still change until then....so keep it with us!